Johannes and Mindy very sad to have had to experience the Sopa Lodge. Susanna is obviously enjoying it. 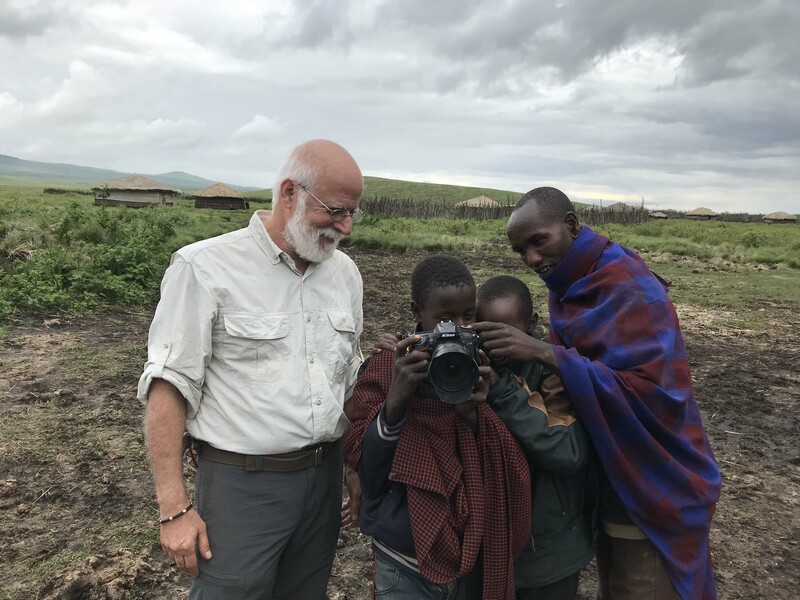 For our trip to Empakai Crater and Ngorongoro Conservation Area, I had decided to see whether Sokoine could possibly accompany us and perhaps we could arrange a visit to his father’s boma where he had grown up. 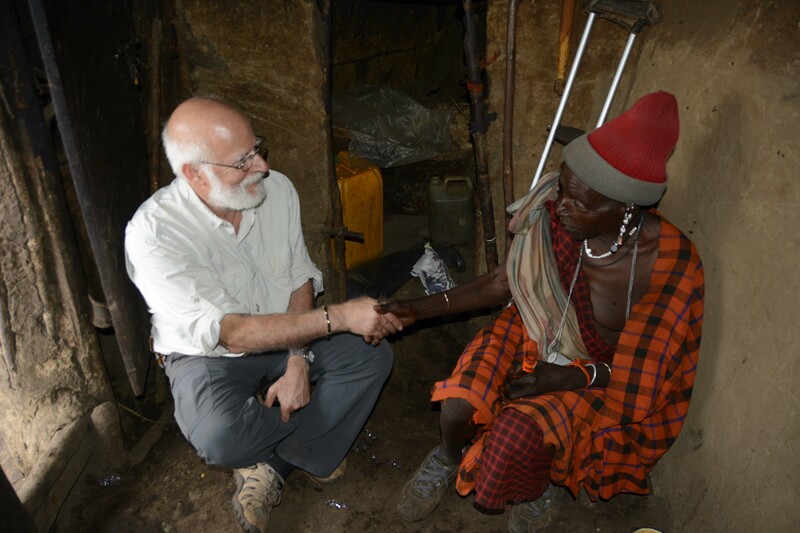 He has been living in Arusha for the last several months, but had agreed to travel here and meet us in Karatu where we would buy some gifts to bring for his father as that is the appropriate gesture when visiting a boma socially. 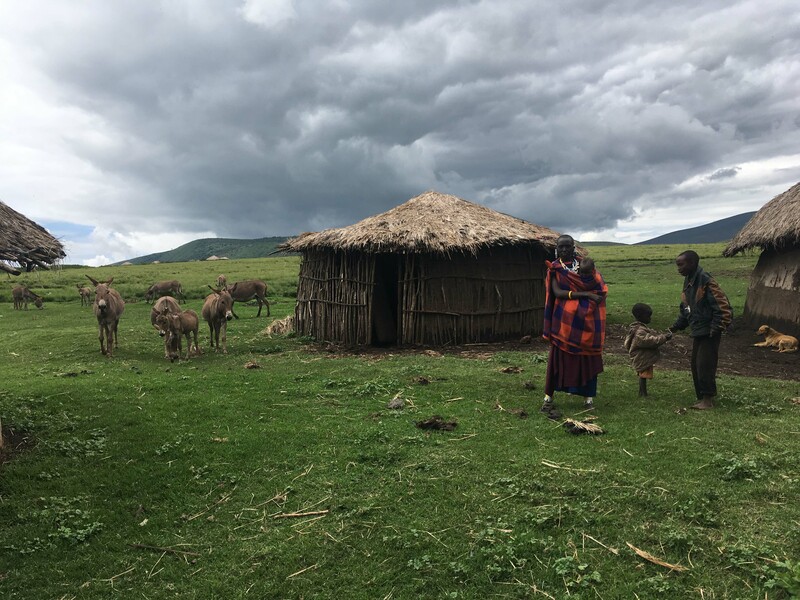 Their boma sits in a gorgeous valley that is beyond the big crater (Ngorongoro) and is among a number of surrounding Maasai villages that are so numerous there. 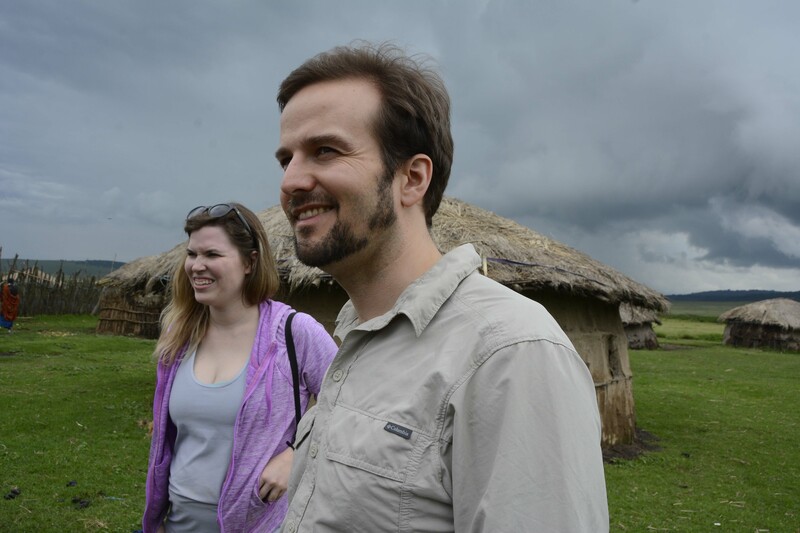 I have been to his father’s boma on two prior occasions and there is always something new that I see for the first time so I never refuse an offer to go back. The residents were also all very excited about the prospect of visiting a boma so we left town that morning with lots of excitement and enthusiasm as we’d not only get to visit the boma, but also hike into Empakai Crater, which is truly a unique experience as the scenery is so unique and it’s rare that you are able to hike through a forest teaming with animals. 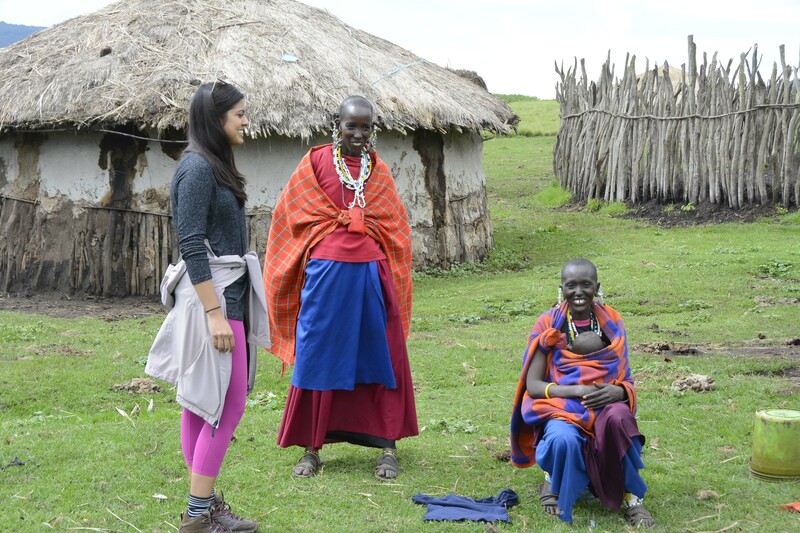 No worries, though, for we do have a Maasai guide with us who carries with him a spear that can be used if needed, How he would ever protect a group, though, with a single spear against a charging lion is a little beyond me, but hey, we’re in Africa and that is how things are done here. Since we weren’t leaving at the crack of dawn, there was plenty of time to make sandwiches for lunch along with some other snacks that we’d bring such as cutup pineapple, sliced cheese and, of course, some Coke Zeros. We also packed extra sandwiches for Sokoine and Philipo, our guide, who would protect us while hiking into Empakai. 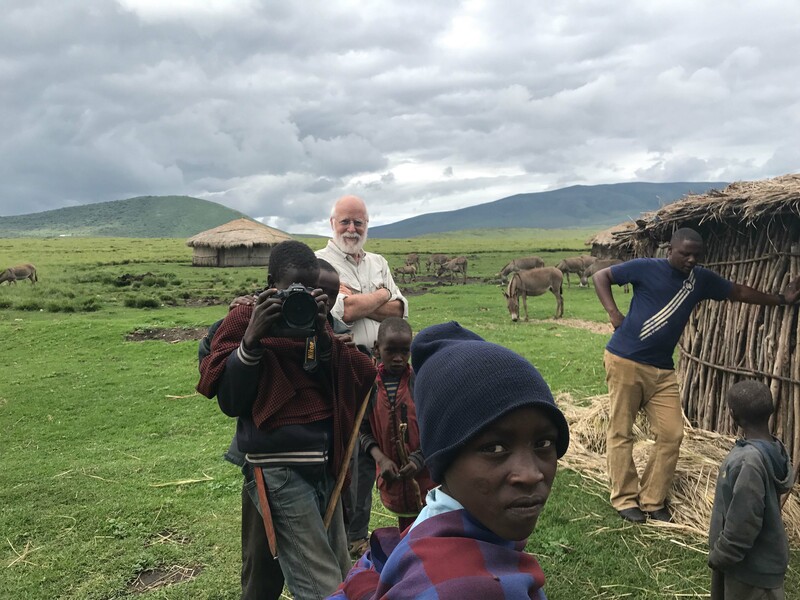 After meeting up with Sokoine in town and picking up all the supplies we’d bring to his father as gifts, we departed for the Ngorongoro Conservation Area gate that was about 20 minutes out of town to the west. Getting through this gate has always been a huge source of stress for me, as the requirements seem to continuously change every time I get there. Over the last several years, they have required that you deposit money into one of the national banks here and that would remain I that account until it’s used. You would take the receipt of deposit up to the gate and, as long as you had the correct amount of money deposited, they would grant you access to the NCA. You couldn’t use cash at any of the gates, as much of it would disappear. Thankfully, over the last year, they have now allowed the use of credit cards at the gate, so it has become a much simpler process. On arriving at the gate this time, though, we were immediately confronted by a government official wanting to see all of the paperwork for our vehicle to make sure the appropriate taxes had been paid (which they thankfully were). Once inside the gate office, we were again confronted by another official asking us the very same questions. Finally at the window to purchase our entrance fees, the agent wanted to know which safari company we were traveling with and where our booking confirmations were. I took forever to convince him that I was the driver as he was somehow under the impression that Sokoine was our driver/guide and that we were trying to avoid paying additional fees. Once that was all straightened out, they let us on our way and we were finally through the gate heading up to the crater rim. The long winding road up to the crater rim is like driving through a primordial forest as the drop-offs are severe and the trees, many of which are quite large, are incredibly tall as they reach for a share of sunlight from the bottom of the gorges that accompany us as we make our way. Every form of vine imaginable are hanging from the trees as we travel up and up towards the rim which has an elevation of over 7500 feet. As we approach the top, the assent road immediately takes you to the overlook, with an incredible panoramic view of this amazing geologic feature. 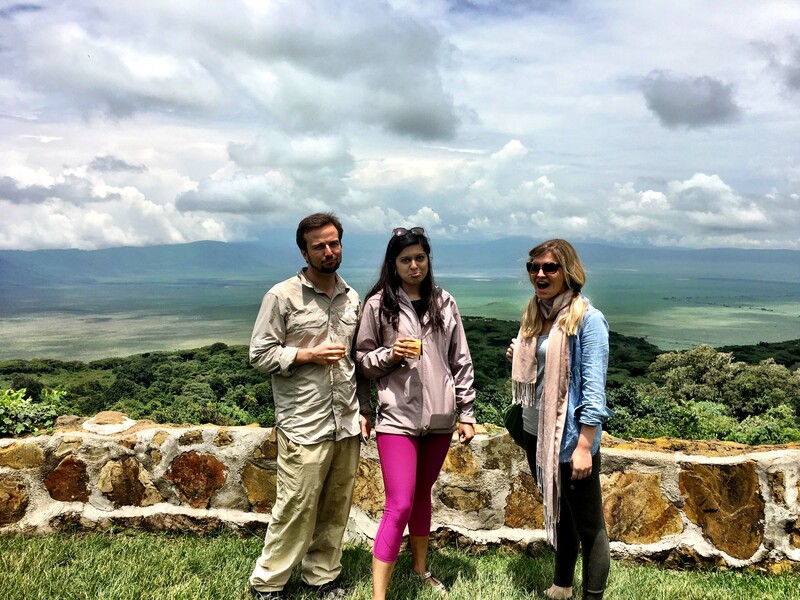 Ngorongoro Crater is actually a massive caldera formed by an ancient volcano and is ten miles in diameter and 2000 feet deep. The walls of the crater are quite steep and there are only three access roads into it – a descent road on the far opposite side, an assent road half way around to our left and a two-way road half way around to our right. At the bottom of the crater there is a very large lake near the center and a smaller lake where most groups have lunch. Roads crisscross the bottom of the crater and from above, everything looks so close, but having been inside many times, it is a vast openness filled with animals that have no need to migrate as everything is here for them. The crater is also home to the largest collection of black rhinos in the world as they are an endangered species. Every type of animal is here other than the giraffe, as the steep walls are too difficult for them to navigate, and the Nile crocodile, as there is no flowing river here. It is truly a magnificent wonder and as you descent into it you feel as though you are entering another world. This crater wasn’t our destination today, though, as we were traveling to Empakai Crater, which is smaller, but equally gorgeous and is unique as you hike down into it rather than drive. 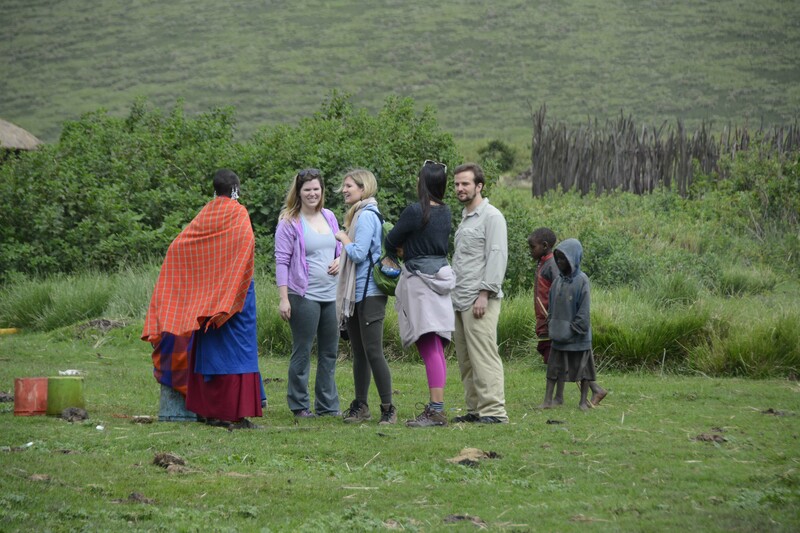 It is north of Ngorongoro and is one of three large caldera that are the remnants of a vast volcanic range of mountains that also includes Kilimanjaro far to the east. 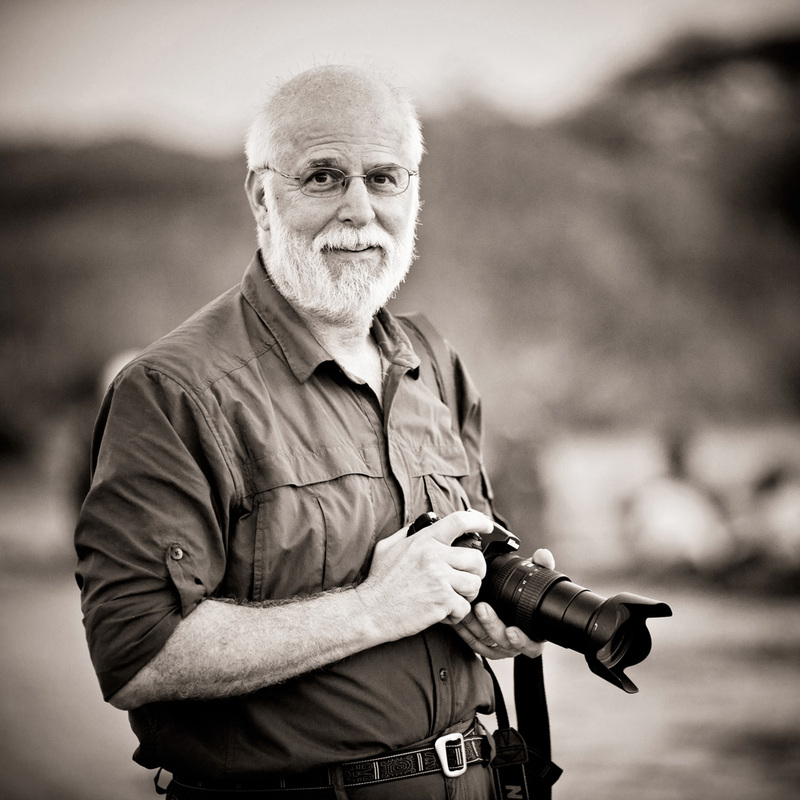 The drive around the rim has to be one of the most scenic roads in the world as you have the crater constantly on one side and you are looking out towards Karatu on the side we are on or the Serengeti on the far side. You travel up and down the undulations of the rim, always with the chance of spotting animals along the way. Two years ago, we had a leopard jump out into the road in front of us and then slowly wander alongside our vehicle in full view. This drive is an amazing experience in itself. Once we were driving along the rim road this morning, though, we ran into a bit of a problem with our vehicle. A constant squeaking that we had heard earlier, much like one of the many squeaks you hear on a twenty-year-old Land Cruiser, began to get louder and then we developed a loud clunking noise underneath the vehicle that was a bit more worrisome. The clunk eventually turned to a loud vibration that would develop when we hit potholes that are essentially constant on these had packed mud roads. I could get the vibration to stop briefly by slowing to a stop, but it would quickly occur again and we were eventually driving at a snails pace to keep it from being constant. I had gotten out twice to see what the problem was, but thought it was in the suspension and hadn’t seen anything. On the third look, though, I spotted the problem, and it wasn’t good. The cross bearing on the rear drive shaft just behind the transfer case had come apart and it didn’t look like it would make it much further if something wasn’t done. Becoming stranded on the crater rim wasn’t something I looked forward to as it has happened once before to me. Our choice was for us to turn around and hope that we could make it to the gate without breaking down or possibly limp another five or so kilometers to the Sopa Lodge and hope that they had someone there on a Sunday morning who could even look at the vehicle, and then the question would be whether they could even fix it. Either possibility seemed quite unlikely, but Sokoine, who studied tourist management before and had worked at several of the Sopa Lodges made a few phone calls and the prospect of having something done seemed to become a bit more encouraging. So we limped ahead towards the Sopa Lodge, driving about 30 kph maximum and, amazingly, made it to the Lodge with the vehicle still making forward progress, albeit at a fraction of my normal speed. The mechanics had gone home for the day, but the manager made a few calls on his radio and we were instructed to drive back towards the staff housing where the “garage,” which was essentially a very small workshop with a compressor and a pit in the ground for the mechanics to stand in while they worked on the car. As we had pulled into the lodge, we had also discovered that we had a flat rear tire that also had to be repaired, but I eventually drove into the workshop on top of the pit and the mechanic got under the car to announce that, indeed, it was our driveshaft, but that he could fix the problem. The solution turned out to be taking the entire rear driveshaft out and then engaging the four-wheel drive that would essentially give us only front wheel drive since there was now no drive shaft in the rear. The remedy would allow us to drive, but having only front wheel drive in a massive stretch Land Cruiser wasn’t something I looked forward to, especially on these roads, some of which were quick muddy and rain soaked. Getting into any situation that would require four-wheel drive to extricate ourselves just wasn’t an option any longer, but that isn’t always up to the driver, unfortunately. 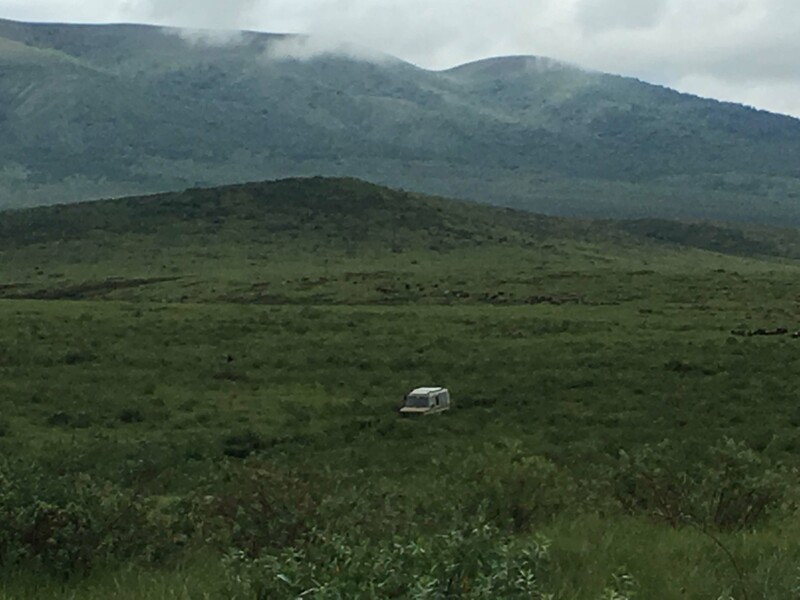 While the vehicle was being fixed, the others enjoyed the amenities of the Sopa Lodge, which arguably has the absolute best view of Ngorongoro Crater, and when it began to rain a bit, they sat inside the “Crater View Bar” which they had all to their own and had a picnic lunch. We were on our way after about two hours and, though, we had to abandon our plans to go to Empakai Crater as it was too far and remote to risk another breakdown, and we didn’t have enough time left to do it as the park gate closes at 6pm. 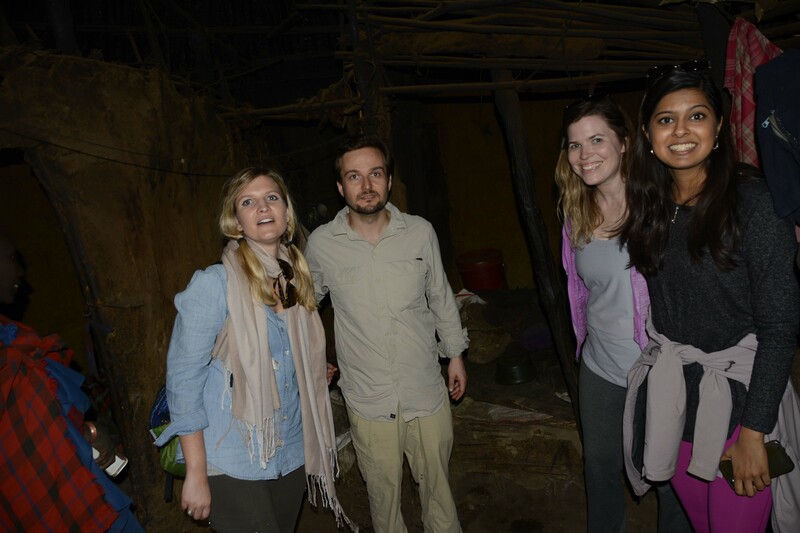 Instead, we decided to just to go Sokoine’s father’s boma and visit his family. 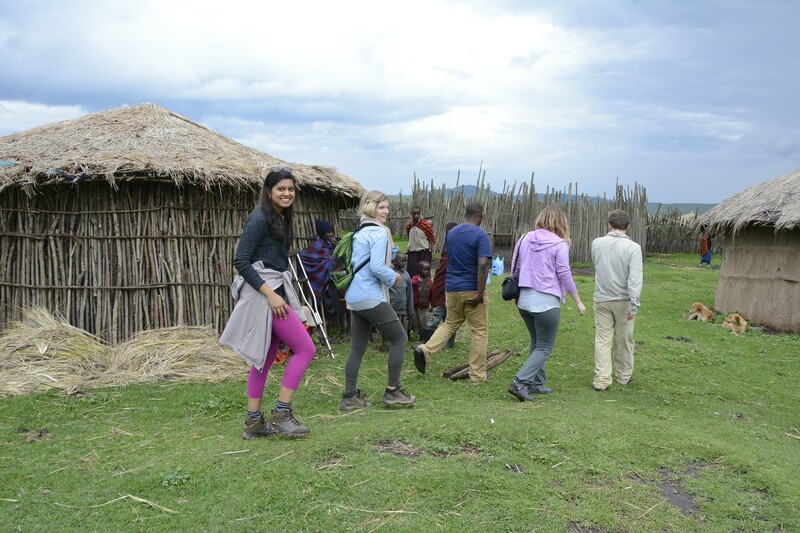 The short distance of six or so kilometers was a bit muddy, but we were able to navigate it safely and arrived to the small trail of a road that would take us to the boma. I drove a short distance and didn’t like what I saw ahead of us as the last thing I wanted to do was to get stuck in the mud here after all we’d been through. 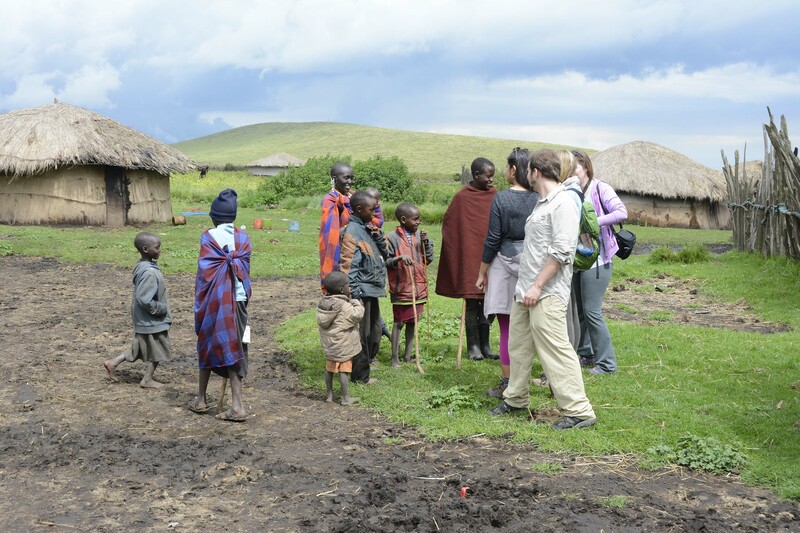 We unloaded the gifts we had brought and made our way the remaining short distance to the huts that were a short ways down the road. 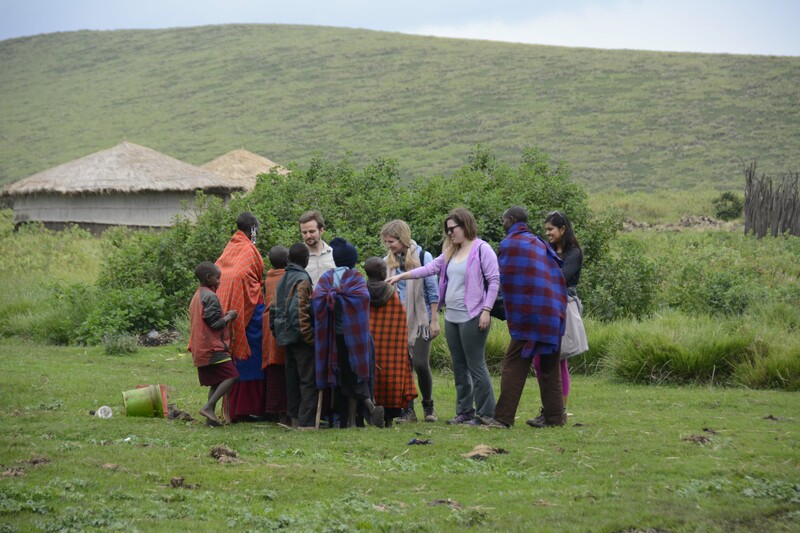 As we entered the boma, we were first greeted by children which is always the case and then by other members of Sokoine’s family. 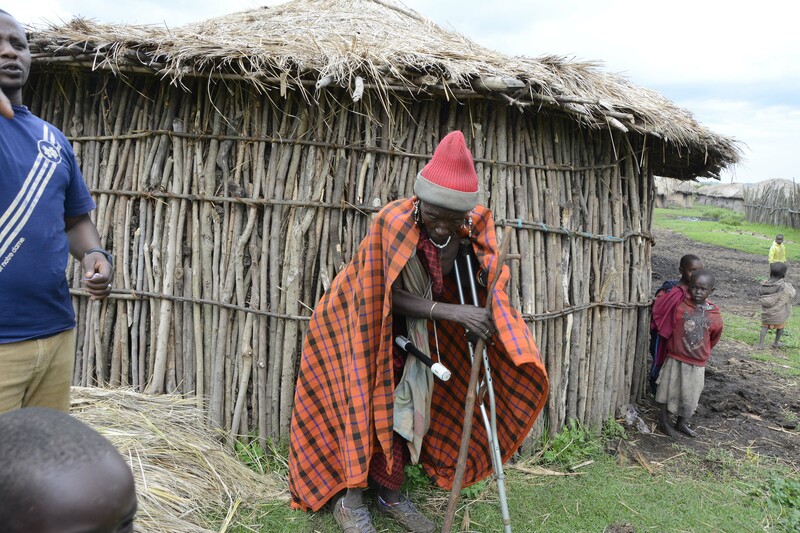 His father has five wives, four of whom live it he boma as Sokoine’s mother is living some distance away near Oldupai Gorge where he father used to travel occasionally, but no longer can given his age (he is 86 now) and arthritis. 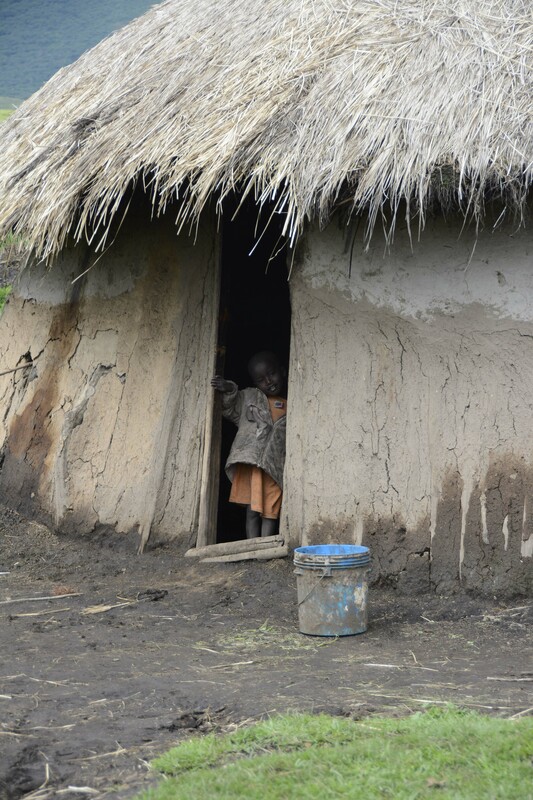 His father, four of his wives, most of his sons and some of their families (including grandchildren too numerous to count) all live in this enclave of mud and dung huts that is referred to as a boma. Small corrals for the animals at night are located in the center of the boma to protect them at night against the lions and hyenas, thought they still lose animals to these predators on a regular basis, there having been a hyena attack the night before with the lose of two donkeys and injury to a third. 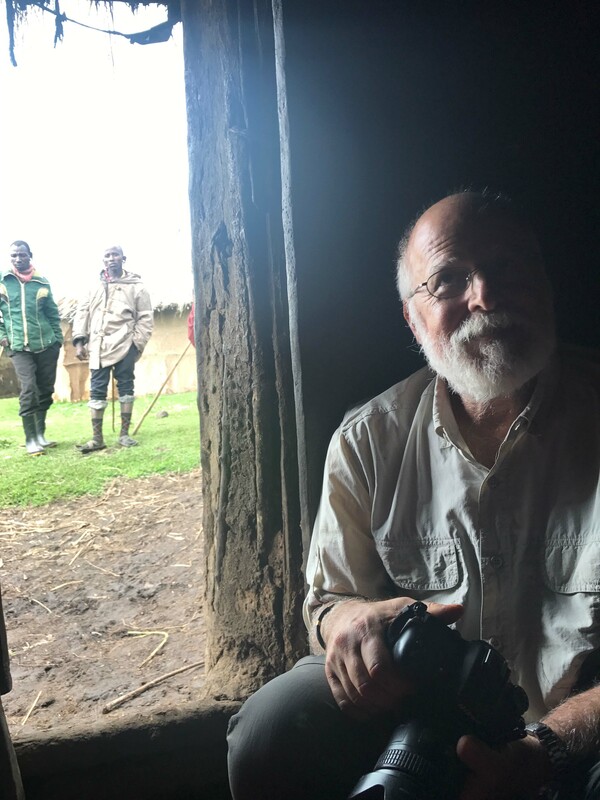 We made our way through the boma to find Sokoine’s father and eventually did find him sitting beside his youngest wife’s hut with lots of grandchildren surrounding him. He is a small and aged man, but one can clearly see his profound character and prominence when you sit with him and talk. 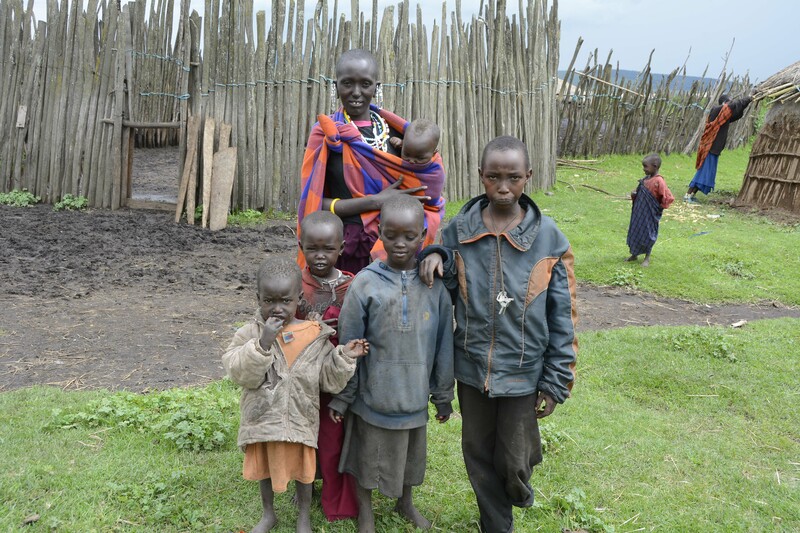 Wealth in the Maasai world is based on cattle and children and he has many of each. 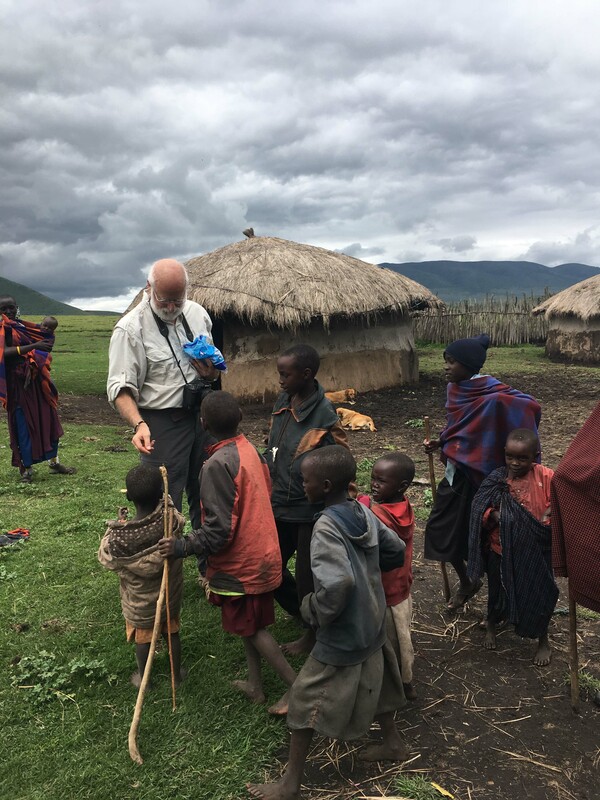 We gave him his gifts, which were promptly stored inside his hut, and then we roamed through the boma enjoying the many children who were thrilled to have the hard candies that Sokoine had brought with us for this exact reason. A few of the older boys were fascinated by my camera so I put the strap around one of their necks and showed them where the shutter was. He promptly took lots of photos as I had the shutter still on continuous mode, but that’s OK as we’re in the digital age and I knew that I could just delete the photos later. 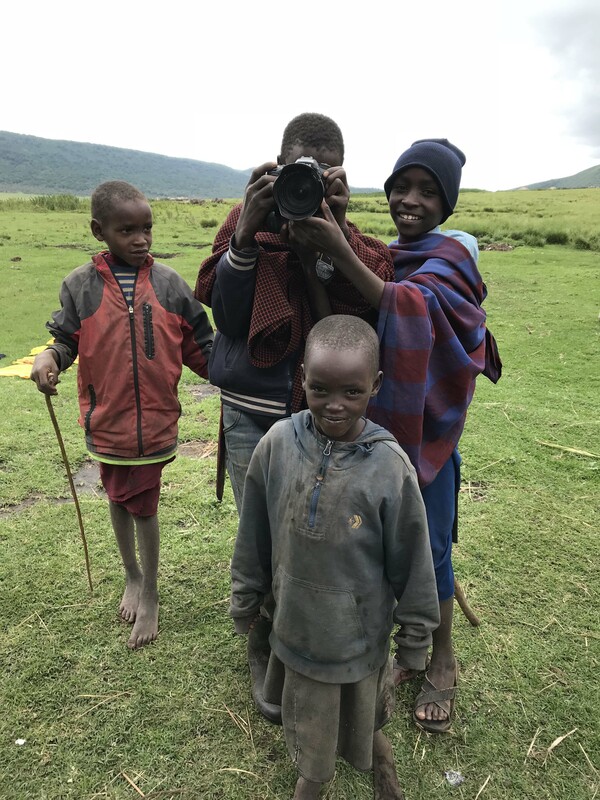 Several of the boys wanted to try the camera so I patiently showed each one how to use it and allowed them to play with it. 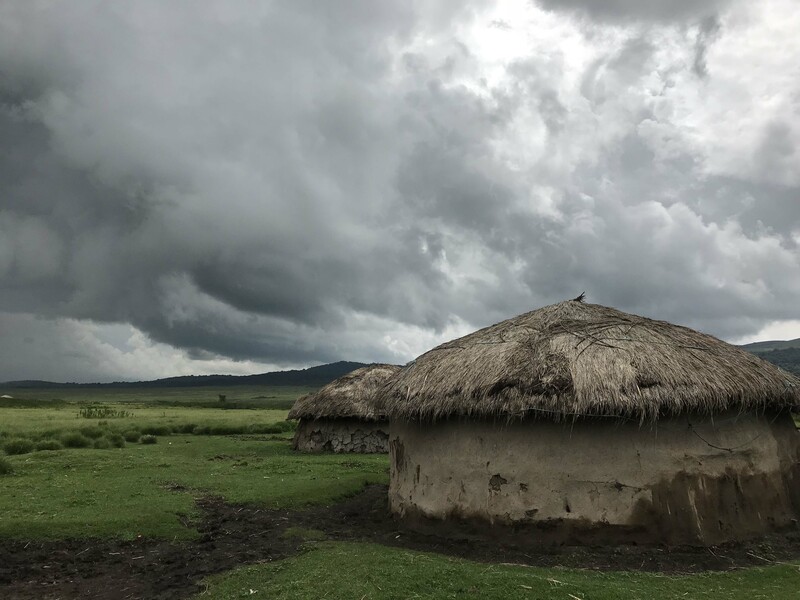 There is some grass between the huts where were wandered, but the majority of the ground is covered in reasonable fresh cow manure and most of the children run barefoot through it with little concern while we watch every step trying to collect as little of it on our shoes as possible. 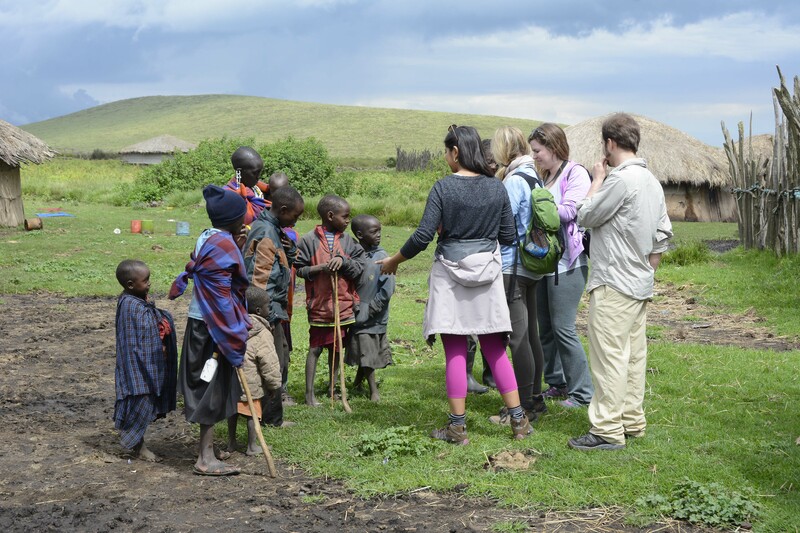 I’ve been here twice before and I always enjoy just watching the residents interact with the children and women here for most of the men are out with the cattle during the daytime. 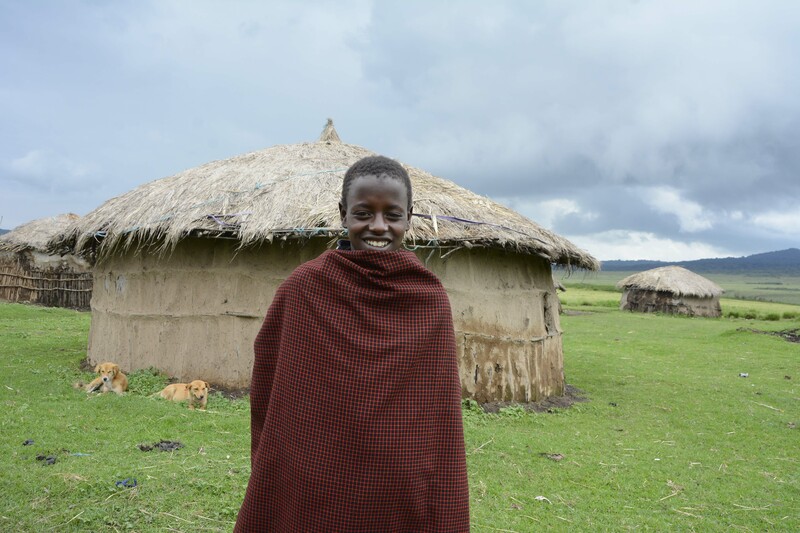 Eventually, we all went to have a seat with Sokoine’s father inside his youngest wife’s hut. There was an outer area inside the hut that we first sat in a all shared a drink of the Konyagi, a strong gin that is made in the country and is very cheap, that we had brought as a gift for him as Sokoine made sure we know that true friends do not visit a boma without this gift in addition to the other many supplies we had brought like cooking oil, beans, sugar and such. 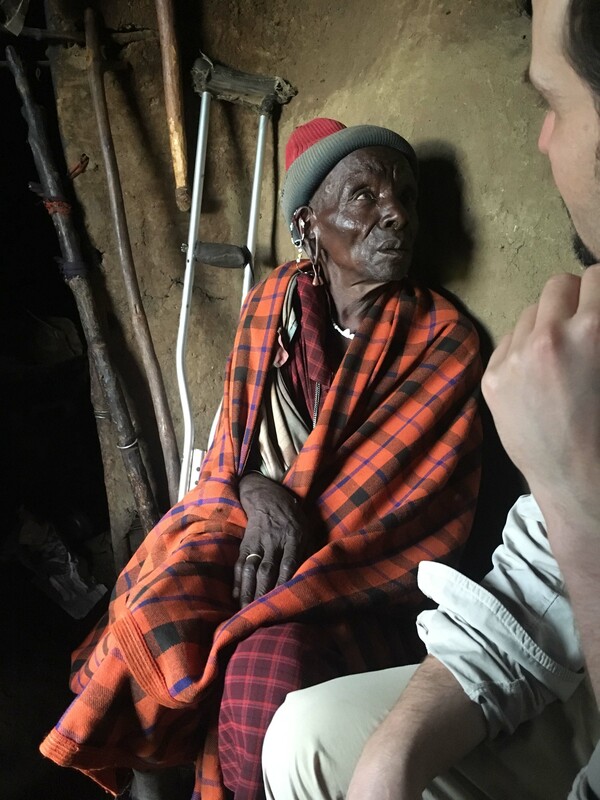 I sat next to his father who recognized me from my previous visits and we exchanged complements with each other. 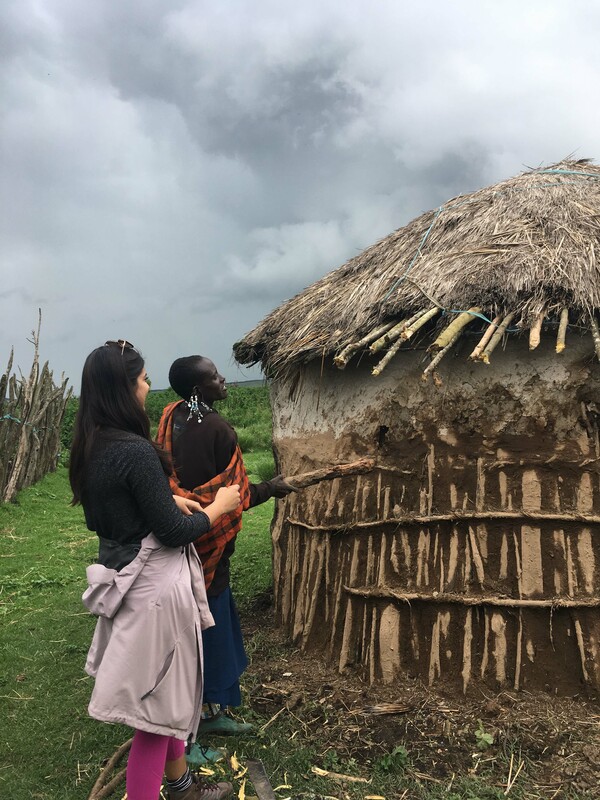 After this, Sokoine took the others further inside the hut to see the living area where there are beds, room for some animals and a fire to burn for warmth. It is a very simple existence with absolutely no amenities. They bath outside using well water, milk the cows in the morning for their drink and occasionally slaughter a goat for their meat. The normal sustenance is ugali, which is the still porridge that is made from maize and is eaten either with vegetables or meat. 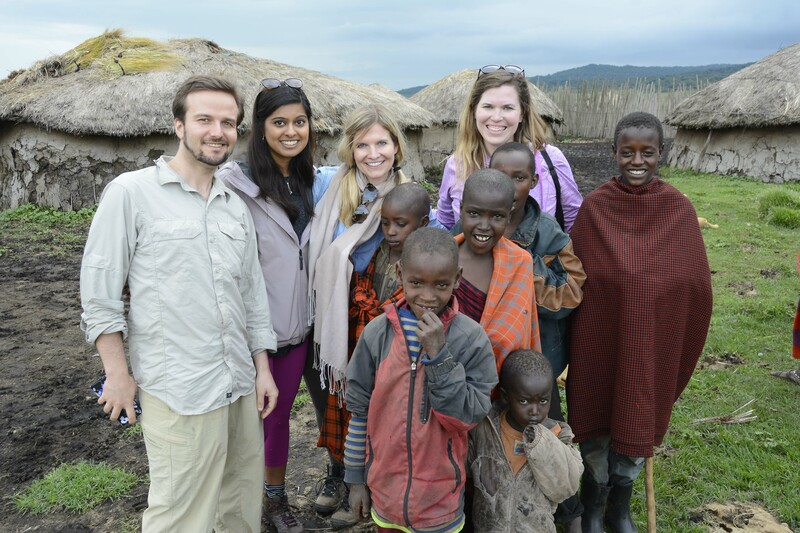 After their tour of the hut, we all again sat with his father and everyone got to ask lots of question, though Mindy was by far the most curious, having many excellent questions about their culture and religion, and, thankfully, stayed away from any of the more difficult questions such as women’s education and female circumcision, that is still practiced in the bomas even though it has been outlawed by the government. 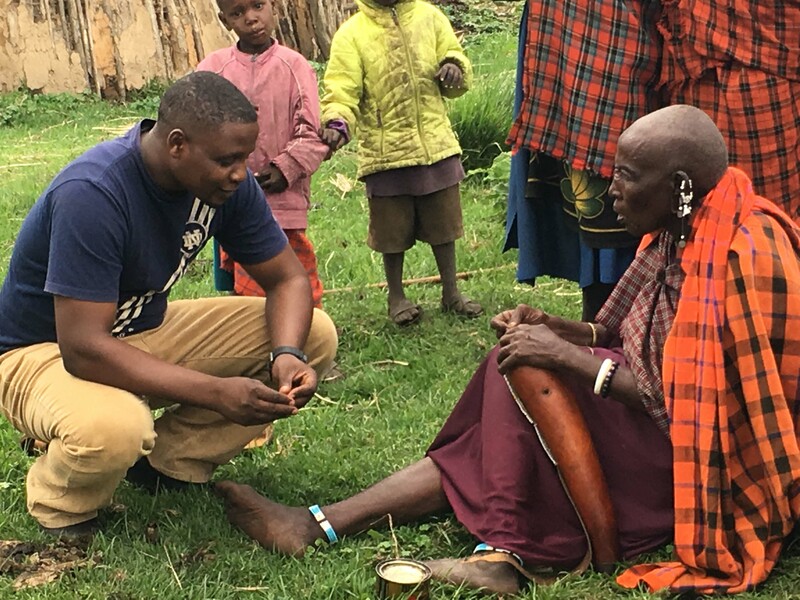 These questions would not have been appropriate to ask in this setting for certain, though they are huge issues that must eventually be tackled by the Maasai. 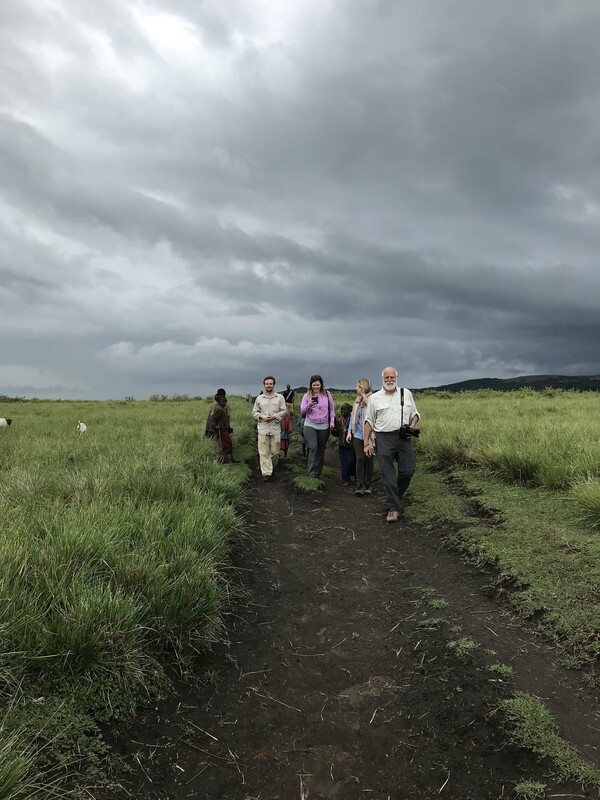 As we had to get back to the gate by 6pm, we eventually had to say our goodbyes to everyone at the boma, though the children all followed us back to our vehicle, still waving as we backed out of the small trail we were on and onto the main road back to the crater rim. We still were not home free as the road was quite slippery in some places so there was still the challenge of making it back around the rim and down to the gate in time. We eventually came to one incredibly slippery uphill section that I tried twice to get up and finally had everyone get out of the car to make my third attempt a bit lighter. Just before I got underway, a safari vehicle came down and the driver offered to take it up the hill for us. He did so successfully, and even though my machismo may have suffered a tad, I was just happy that the vehicle was now on the other side so we could be on our way. I drove like a banshee for the remainder of the distance and, even with that, we made it to the gate with just ten minutes to spare as they close the gate at 6pm sharp and you have to pay for an additional day to get out, something that none of us would have been very happy about. 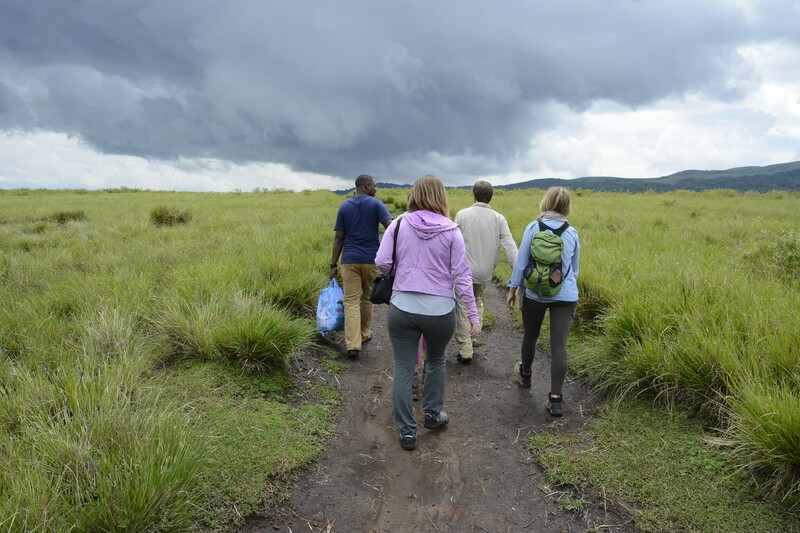 We all felt the sense of having survived something meaningful, though, as we were all nearly stranded in the crater on several occasions and, given the remoteness of this area, that is a feat certainly worthy of a great accomplishment. We all cheered as we passed through the gate with minutes to spare, still with forward progress in our hobbled Land Cruiser, the little engine that could. 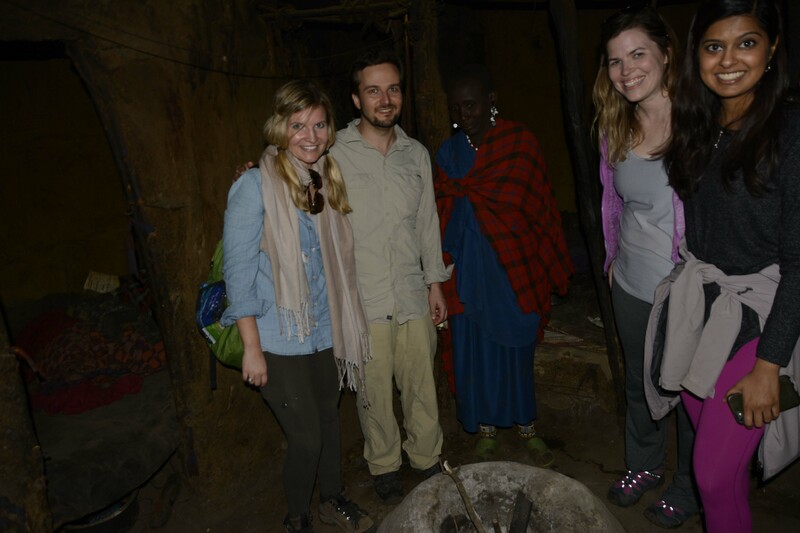 We went into town directly to a local restaurant for some nyamachoma, or, literally, burnt meat, which is their version of barbecued beef or goat. We had a mixture of both, along with some chips, or French fries, and some beers and were all totally satisfied with our wonderful day, despite the challenges that may have made it all that much more satisfying to each of us. It was really an incredible day all around. 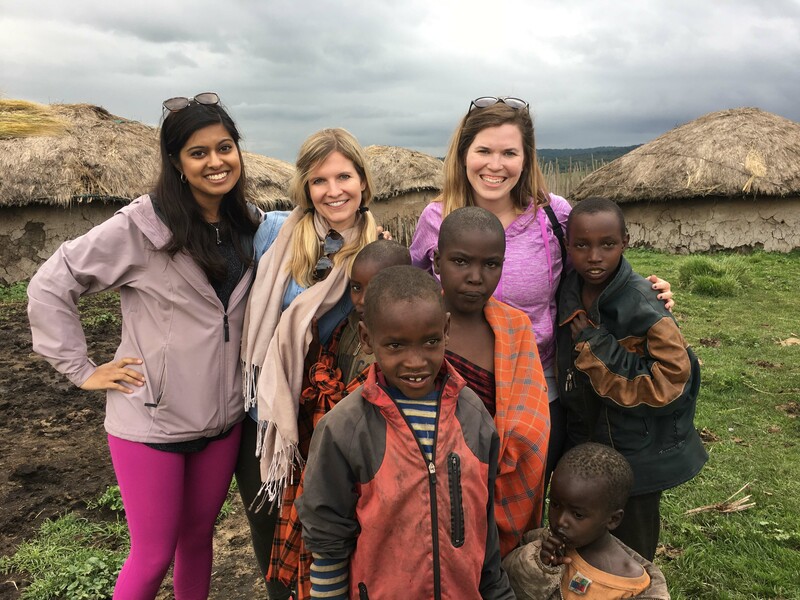 Monday, March 19, 2018 – Day one of mobile clinic at Kambi ya Simba….